LATISSE Eyelash is the first FDA-approved prescription eyelash growth product that has been clinically proven to grow your eyelashes and make them longer, thicker, and fuller. Created by the manufacturer of Botox Cosmetic, LATISSE (bimatoprost ophthalmic solution) 0.03% is a major breakthrough formula in the eyelash enhancement world and it can dramatically enhance the length, thickness and fullness of your eyelashes. Latisse works gradually and remarkably, with results already seen within four weeks and achieving full results after 16 weeks. Once you begin treatment, you could start to see results in as little as 4 weeks and then more results gradually over time. 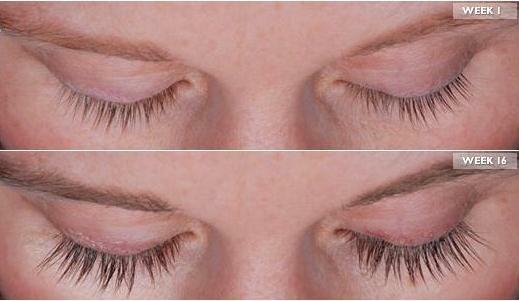 Latisse works from the inside out. As the treatment progresses, you'll begin to see changes in length, thickness and darkness gradually. After week 16, you'll see the full effect of LATISSE and so will others. In the clinical study, 78% had a significant increase in overall eyelash prominence (including elements of length, fullness, and darkness) at week 16. Bimatoprost is the active pharmaceutical ingredient in the formulation of LATISSE� and is proven to be safe and has been approved by the FDA in 2001. Bimatroprost is a structural prostaglandin analog, a lipid compound derived from fatty acids designed to bind to prostaglandin (PG) receptors. PG receptors are present in hair, particularly in the dermal papilla and outer root sheath. Although the precise mechanism of action is unknown, PG receptors are thought to be involved in the development and regrowth of the hair follicle, by increasing the percent of hairs in, and the duration of, the anagen or growth phase.